Hiring? Toptal handpicks top Google Docs engineers to suit your needs. Spreadsheets are one of the most common tools of the current business world. There are multiple implementations of spreadsheet software, with some differences among them all, but no matter which one is being used, for those whose work depends on them, they are absolutely indispensable. "Spreadsheets: Easy to learn, hard to master"
Why Is Google Sheets’ Apps Script So Cool? The flexibility of spreadsheets makes it a fantastic tool for entrepreneurs and startups. With additional Apps scripts, enhancement the possibilities become endless. The first time I found it to be useful was about seven years ago. I was running a website with a group of editors and we wanted to set and measure certain goals. There was no easy way to create a custom report which would contain data from Analytics, AdSense, and Facebook on one page. It was also important to create reports based on fresh data, with daily updates. The first idea was to create a spreadsheet and keep all the numbers there, but it was difficult to keep it updated. After some research, I found that Apps scripts may be a solution! It allows you to modify the document, fetch data from third-party services, and automate the whole workflow. Since then, I’ve created dozens of spreadsheets to handle a variety of use cases. The common, general, use case is to retrieve information from any accessible REST API. You can do that on demand, but also at set intervals using a cron-like mechanism. Creating a React Native app, I had to make a small chunk of a config file editable by non-technical moderators. A simple JSON-like file would be exactly what I needed, so my solution was to create a spreadsheet, create a method to collect data from specific cells, and update the configuration on the server. Importing account transactions from your bank—you can use your bank API or scrape the banking page with tools like Puppeteer and export data to JSON, which can be automatically imported to your spreadsheet. Quickly develop prototypes of apps or dashboards. It’s easy to quickly create an interface which makes it a great tool to prepare first working prototypes and validate an idea. Forward Google Forms responses from a spreadsheet to Slack. Create a Secret Santa group by automating assignments, emailing reminders, and tracking information for incoming packages, and keeping everyone in the loop all from a spreadsheet. The possibilities are endless. Let’s take a closer look and create a sample extension. Instead of that, we are going to use another tool created by Google called Clasp. It’s a command line tool which helps with local development of Apps Script tools. 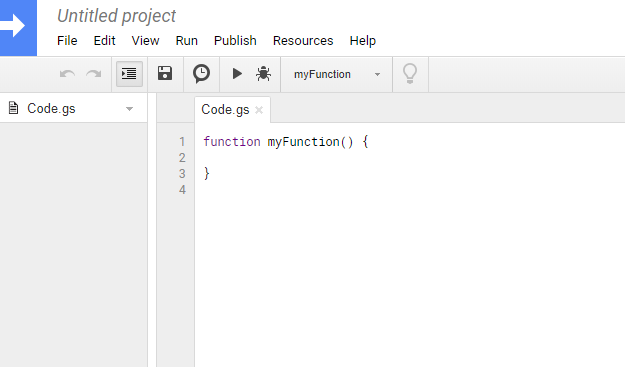 This way, we will be able to keep the code in a Git repository and collaborate with other Google Docs developers. It also helps with deployments. clasp create "VAT ID Validator"
Note down both URLs, we are going to need them later. Now you are ready to open the folder in your favorite editor and to start hacking! And open the script editor in your browser (you got the link on step creation). Here you can run and test the code. Select Run > Run function > validate. Protip: Clasp allows you to run the functions directly from CLI. It requires additional setup of the project. You will find more information here. For the first time, Clasp will ask you for a project ID. To get it, go back to the script editor and select Resources> Cloud Platform project. In the popup, you will find the ID, starting from project-id-xxxxxxxxx. Copy and paste the whole ID in the console. After a while, you will find your logged “hello world” in the console. Protip: Both commands clasp push and clasp logs accept the --watch flag, which may be useful during development. Protip: Clasp allows you to write the code in TypeScript. This way you are getting access to arrow functions, classes, typings, and much more. You can find more details here. So far, we have a piece of code which calls an external API, but it’s not integrated with the spreadsheet. It’s time to change that. The idea is to make it possible to select multiple cells in the document and then call the validation mechanism. Validated VAT numbers will highlight on green or red. Simply paste them to the spreadsheet, select all five cells, and click on Validate once again. Voilà! The first three are valid and should be highlighted in green. The other two will be red, as those are not valid VAT ID numbers. Find an API to handle validation, just like we did above for VAT ID. That will be more accurate for TIN where you need to check not only the data format but also validate if the number is officially registered. Write your own logic directly in the Apps scripts. For credit card validation, you can follow specific rules and most of them can be validated with the Luhn algorithm. This is only an introduction and the above example is quite simple, but keep in mind that the business logic in your Apps scripts can be much more advanced. You can use custom JS libraries, which will help you to achieve more complicated tasks. One of them I often use is Moment.js—working with dates on Vanilla JS is a horrifying experience. Another thing you can do, if your script solves a more general problem, is deployment of your Apps script as an add-on. This will allow you to share the script with other users. You can even choose between sharing the add-on with your organization only or make it public for everyone. It will appear in the add-ons library and will be ready to use in any spreadsheet. The deployment process isn’t complicated and the first step is to prepare the code for testing. You can find more information about that here. If you decide you are ready to go you can publish your add-on. Take note, if you choose to publish your code publicly, it will be reviewed by the Google team to make sure it complies with standards for app publications. That’s all you need to know to start hacking. The possibilities are limitless. Apps scripts work not only with Google Spreadsheets but also with Docs and Slides. The next time you need to find a way to automate some processes or workflows, keep in mind it may be easily achieved with Apps scripts. In this post, we discussed only the tip of the iceberg. You can inspire yourself or find a ready solution browsing the rich add-ons library. How do I access Google Apps scripts? Open your spreadsheet document and navigate to Tools > Script Editor. How do I write and edit a Google Apps script? You can use the provided script editor, but it’s more convenient to use your own IDE together with Clasp, a CLI tool developed by Google to sync and run your Apps script. What language is Google Apps script? Is it possible to collaborate with other devs working on an Apps script? Using Clasp, you can keep the code in any kind of repository and collaborate with other developers. How can I share my extensions within my company or with other users? You can publish your extension as an add-on. It’s possible to make it accessible only for users within your organization, or publicly for every user. Interesting read. I have learnt the right approach to automate some processes i repeat daily. Thanks! Wojciech is a full-stack web developer with over eleven years' experience creating fast and efficient applications for mobile, desktop, and web platforms. As an entrepreneur, he understands the importance of big-picture thinking, especially during the implementation of daily tasks, and is able to manage and lead remote teams. As an engineer, he prides himself on writing clean, readable, and easily maintainable code.